The Homebase Value stuff has rave reviews, so I would expect this to be of decent enough quality. It is also dirt cheap at just over £5 per square metre - most vinyl's I've seen are nearly twice that. 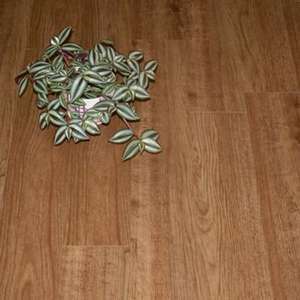 - The Vinyl wood effect flooring can give a classic wood effect look to any room. Free reserve and collect. Home delivery from £3.95. 2.1% TCB on reserve and collect orders. 1.57% TCB on home delivery orders. Agreed but if, like me, you're in rented accomodation and need to re-do a floor or two on the cheap, then this stuff is absolutely ideal and as cheap as it gets. Great comment aandyr123...I also used this in a temp accomodation,good price to cheer up a home. I guess its all horses for courses as the real thing works out bit more than twice as much but i like real wood. Vinyl much better in wet rooms and kitchens mind! Blown vinyl maybe. This isn't the same. Any idea what you're talking about? I am a contract vinyl floor fitter and install vinyls throughout the UK for schools, banks, shops, hospitals etc... in fact other than 'linoleum' which is virtually unused these days, vinyl is your only option in a commercial environment. As for domestic, decent vinyl tiles (admittedly not these) will outlast most alternative hard floor coverings. Have you heard of Amtico or Karndean? Some of their ranges are £100m2 and they're trading as strong as ever. I also thought worth mentioning that home base are having a multi million pound stock clearance (big banner hanging outside my local store) Dagenham. Any idea what you're talking about? I am a contract vinyl floor fitter … Any idea what you're talking about? I am a contract vinyl floor fitter and install vinyls throughout the UK for schools, banks, shops, hospitals etc... in fact other than 'linoleum' which is virtually unused these days, vinyl is your only option in a commercial environment. As for domestic, decent vinyl tiles (admittedly not these) will outlast most alternative hard floor coverings. Have you heard of Amtico or Karndean? Some of their ranges are £100m2 and they're trading as strong as ever. Totally correct. Luxury Vinyl Tile, such as Amtico, Karndean, Polyflor ranges, is probably the most hard wearing, practical and beautiful (excepting "natural beauty" from ceramics and wood) flooring around. They do need sub floor prep and to be fitted properly though, which adds to the cost. LVT is not a cheap option but you get what you pay for. These self adhesive DIY tiles are pretty rubbish. Low grade vinyl, weak adhesive, probably fitted in non-ideal circumstances. Fine to tart up a worn out floor on the cheap but won't look great and won't last long before they are damaged or start to come up. Yep, for rental houses they should do the job well, worry about them next time around! Got mine delivered today.. by the joys of yodel..
That aside, this stuff is impressive for the price. Admittedly the wear layer is very thin but it's solid stuff and looks really good in my kitchen. All fits together well and sticks well too.